The opening and closing of fuel injectors creates pressure pulses in the fuel rail which can lead to unstable fuel pressure. In order to achieve a safe and consistent rail pressure, a fuel pulse damper (FPD) is often necessary. The FPD's internal diaphragm will absorb oscillating pulses and stabilize fuel pressure. This correction can be measured throughout the RPM range and can often help idle surge, especially with high flow injectors. 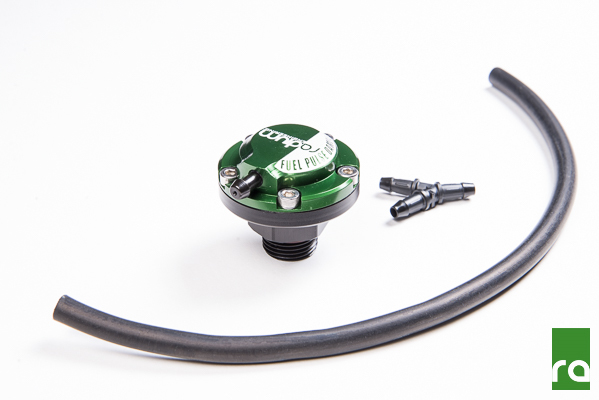 Furthermore, a fuel pulse damper can help solve erratic lean air/fuel ratio spikes, commonly experienced as "stumbling", that are difficult to tune out. 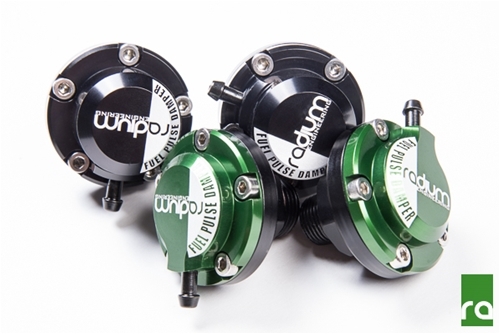 For more in-depth information on the function of fuel pulse dampers, read the Radium blog HERE. 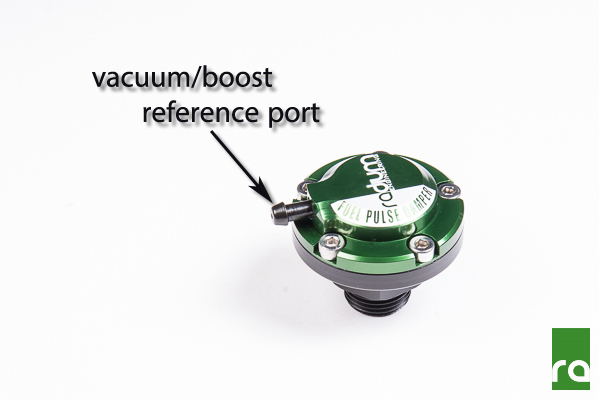 Along with having the flexibilty of using common fittings, Radium Engineering FPD's use a vacuum/boost reference port which allows for proper fuel pulse damper performance even at elevated fuel pressures. This becomes essential for boosted systems that use a 1:1 rising rate fuel pressure regulator. 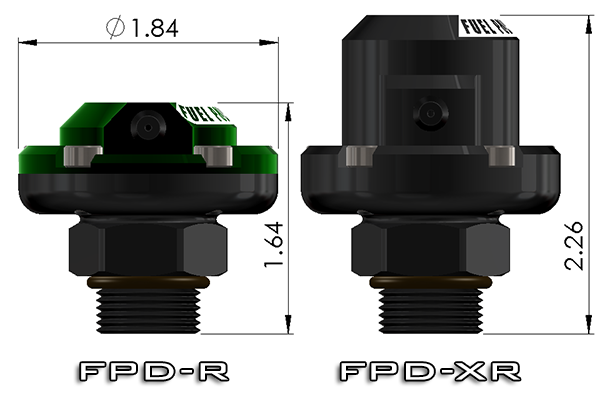 The FPD-R (green top) is slightly shorter than the FPD-XR (black top) allowing it to be used in space-contrained applications. IMPORTANT: The ranges above are base static fuel pressures only. Any dynamic fuel pressure created by a rising-rate FPR outside of this range is acceptable, but only when the base "static" fuel pressure is set within these ranges and the vacuum/boost reference line is connected. Can I use a FPD-R? Yes. Even though fuel pressure is 73.5psi at full boost, the FPD-R will work because the base static pressure was set within the 40-70psi requirement. However, the vacuum/boost reference line must be installed. Can I use a FPD-XR? Yes. Also, the vacuum/boost reference line does not need to be installed since maximum fuel pressure does not exceed 120psi. Can I use a FPD-R? No. Base static fuel pressure exceeds the 40-70psi requirement. 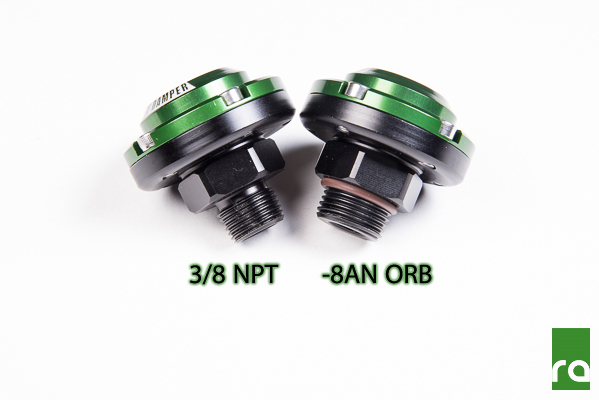 The anodized aluminum housing features two selectable threaded male fittings. The 8AN ORB (3/4"-16 UNF threads) version seals using a Viton O-ring while the 3/8" NPT variation seals with the tapered pipe threads. The FPDs can be mounted at any possible angle including upside down. For best results, the damper should be mounted directly onto the fuel rail(s). This product is safe for use with all fuel types including alcohol blends such as E85. Download the installation instructions for more info. Just wanted to say thank you a ton. That FPD-R solved every issue I had with lean spots in my entire rpm range after removing the stock damper a while back.